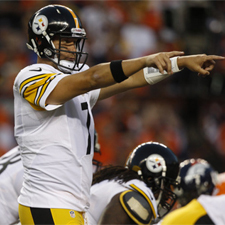 Quarterback Ben Roethlisberger’s use of the no-huddle offense in the second quarter and throughout the second half in the opener signaled what might be the advent of a significant change in the way the Steelers play football on offense. They have used it previously, most famously to win Super Bowl XLIII, but rarely for an entire half in the opening game in a noisy place on the road the way they did Sunday night. At times, Roethlisberger looked more like Peyton Manning than did Manning, running up and down the line, shouting instructions to his teammates, looking at the play clock. If he can do that in the noise and high altitude, it should only be easier to run before the more friendly atmosphere at Heinz Field.